The Malcolm X Jazz Festival, held every year at San Antonio Park, could be described as a way of healing through celebration. Memorializing a person and their artistic contributions to the world can be a joyful experience, and a way to pass their memory on to younger generations. The Malcolm X Jazz Fest pays tribute to those who inspire us. This year’s fest was dedicated to the activist and Black Arts leader Amiri Baraka, who passed away earlier this year. Malcolm X’s life left a huge mark on Amiri Baraka. It was Malcolm X’s murder in 1965 that impelled Baraka’s journey to become a Black Nationalist, paving the way for his intellectual and artistic transformations. There was flurry of music, dance, and art, and widespread evidence of elders passing on their art to the younger attendees. 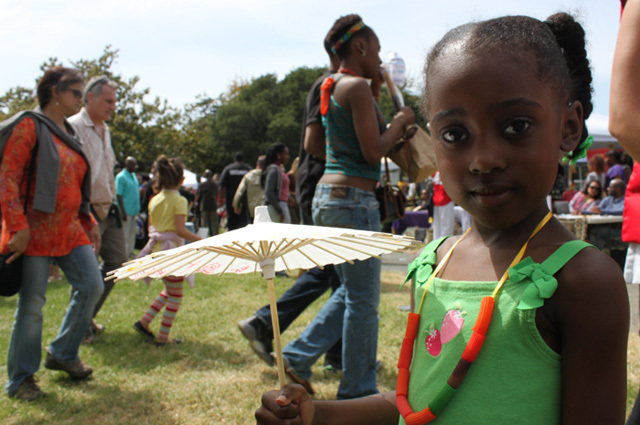 Multigenerational bands played on stage, and OMCA hosted an umbrella-making station (meant for a New Orleans inspired second line), which attracted the widest age range of participants. 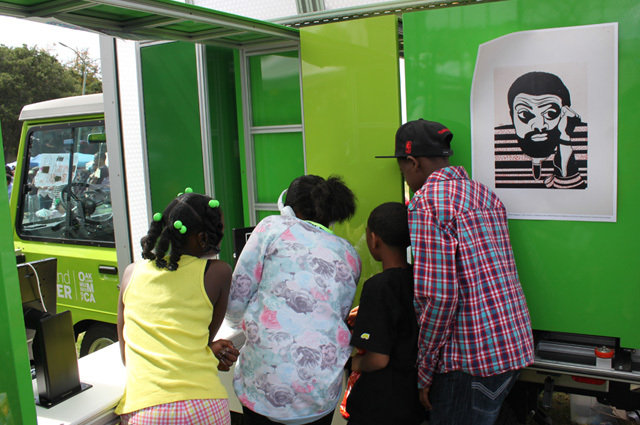 Many adults approached us asking, “Can I make an umbrella, too?” We equipped the Rover with a pull-out display of iPads loaded with videos of Amiri Baraka performing so that people could directly explore his work as well. Malcolm X Jazz Festival attendees could watch lectures and performances by Amiri Baraka on the Oakland Rover. I spent the day talking to people at the festival who shared their stories of personal and community healing. A remarkable amount of the people who I talked to were healers by trade: doulas, foster care advocates, massage therapists, public health workers, faith-based nonprofit workers, and housing activists. Maya Scott Chung, a massage therapist and a public health organizer, shared her passion for oral history and storytelling. We talked about the role storytelling and oral history plays in communities and how it can be a form of healing. Maya, who has worked on the Loving Quilt project and collected LGBT stories, hopes that one day Oakland will house a major archive for LGBT oral histories. She likes the StoryCorps model of oral history, in which two people are in conversation with an observer present. In this way, she sees oral history as a model for healing. Maya also told me that she always looks for the metaphors in healing, or as she called it, the relationship between biography and biology. "Oakland’s diversity," she said, is "a source of healing." Bonita, a case manager for Oakland nonprofit, All of Us or None, works with ex-felons to assist them in obtaining job and housing resources. Mayor Jean Quan spoke to me about psychological impact of segregation. She said that she often sees people organizing out of fear.